This book started off very promising...I even made a Goodreads update around page 50 professing how charming I found the tale to be. But this eventually tapers off and we are stuck with too many humans. 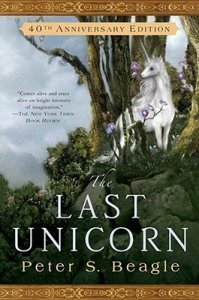 If I'm going to read a story titled The Last Unicorn, I want it to be about the last unicorn, particularly when the story starts off that way. I missed the unicorn. But oh, how touch and bittersweet ~159-60 is (avoiding spoilers...). I was not expecting such a poignant scene! I felt as though I had been kicked in the chest by Prince Lir's late actions, definitely was not expecting that either. And then, there was one particular paragraph that I found beautifully written: Molly imagines a scene from above, as though the characters within it were playthings. Very well written. Despite a dramatic change in tone, I still mostly enjoyed this book. I found it so light and lovely and rather sweet at the beginning, but by the end the story had become so sombre and heavy - I doubt I've ever read a book that transformed so much and in such a small span of pages. I felt uneasy at the 'darker' mood of the latter half of the book, even though it really wasn't all that dark - only so in comparison.